Thank you for taking the time to visit our company's website. Since we opened our doors in 1988 we have made it our number one priority to exceed the customer's expectations by providing outstanding customer service. Please call us anytime if we can be of any assistance. 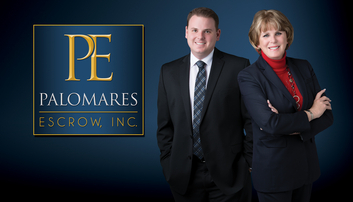 Palomares Escrow serves you with the foundation of Integrity. Our mission is to provide the best possible escrow and closing services at competitive prices to all the real estate communities through out Southern California. Palomares Escrow, Inc. is independent, licensed, bonded and insured with no broker affiliation and is 100% Neutral with it’s Sole Business being Escrow. Make sure your escrow company complies with these rules for your protection and safety!